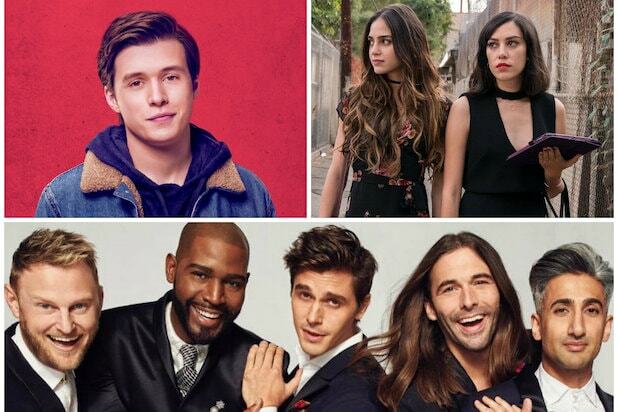 Romantic teen comedy-drama “Love, Simon,” Netflix’s reality show “Queer Eye” and Starz’s comedy series “Vida” took top honors at the 2019 GLAAD Media Awards on Thursday night in Los Angeles. “Love, Simon,” an LGBTQ themed high-school rom-com, took the prize for Outstanding Film Wide Release with Gwyneth Paltrow presenting the award to director Greg Berlanti and cast members Nick Robinson, Keiynan Lonsdale and Alexandra Schipp. Outstanding Reality Program went to “Queer Eye,” Netflix’s reboot of the Bravo series, starring Jonathan Van Ness, Antoni Porowski, Tan France, Bobby Berk and Karamo Brown. “Vida,” about two Mexican-American sisters who return home to a rapidly gentrifying Boyle Heights — and find out their recently deceased mother was in a relationship with a woman — took home the award for Outstanding Comedy Series. The 30th annual GLAAD ceremony also honored Beyoncé and Jay-Z with the Vanguard Award for their support of the LGBTQ community. Jay-Z began their speech by thanking his mother, Gloria Carter, who is a lesbian and who accepted a special award on behalf of her son last year. The rapper said that it was because of his mother that he was able to learn about love and acceptance. Beyonce then told the crowd she was “super honored and overwhelmed and I’m very proud of the run in my stocking from Shangela,” she said about the “Drag Race” alum who earlier in the evening performed a medley of her all her hit songs to a roaring audience. (See below). “Will & Grace” star Sean Hayes was honored with the Stephen F. Kolzak Award, named after the Los Angeles casting director who devoted his life to fighting homophobia. Both were announced ahead of time. At the event, celebrities sported blue “&” pins for GLAAD’s Together movement, representing GLAAD’s work on intersectional issues including immigration, racial justice, women’s rights and LGBTQ acceptance. GLAAD had also previously announced that Madonna will receive the Advocate for Change Award and Andy Cohen will receive the Vito Russo Award from Sarah Jessica Parker in the organizations’ New York City event on May 4, which will air on Logo on Sunday, May 12.